A Bird Hunter's Thoughts: The Puppy Express. The first new friend, however, was Charlie Majors, outside of Houston. You know, as you may have guessed, I do like to drive. And when the new Beast is humming along and quiet and comfortable, it makes a long drive just all that more pleasant. But, at the end of 12 hours, hitting an hour of bumper-to-bumper traffic in beautiful Houston could make a Baptist preacher cuss! 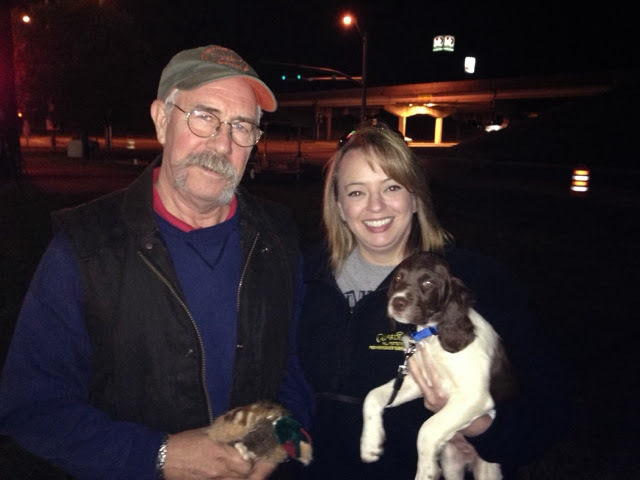 Somehow, we made it through and Charlie and his beautiful daughter met us on the other side of town to pick up Otis. 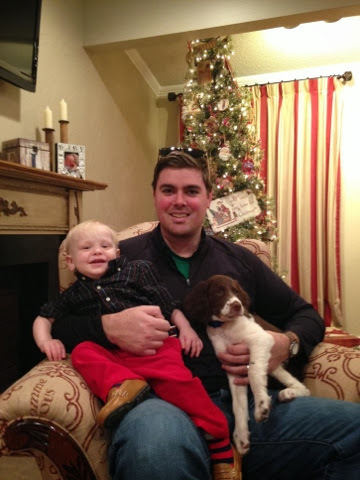 Charlie is a Texas bird hunter and Otis will be working some Bobwhites next season, for sure. Hannah, Hayden and El J. In Nebraska. Charlie Majors, daughter, and Otis near Houston, TX. The next day at noon, I met Jeff Meyers in Stanton, Texas. The drive from Houston to Stanton took me through the Texas Hill Country and then in to desert scrub and Blue Quail country. 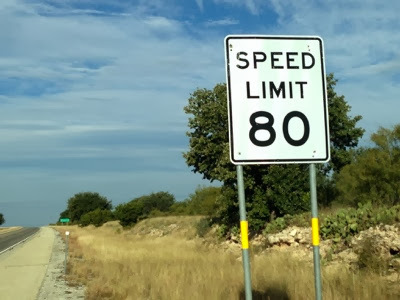 Oil wells, high speed limits, straight roads, polite drivers, dust, mesquite, land-grant ranches, hawks, eagles, bright sun and letting the Beast run. Jeff is a bird hunter in West Texas and little Odessa will be chasing Blues next year. Jeff will be calling with glowing reports of his new little prodigy in the scrub and mesquite desert lands. Those little cotton tops have met their match. I made it to Madison, NE by late late afternoon and Dixie met Cindy and Jeff Mimick. I'm not sure who was more happy at this initial meeting! Dixie will be a pheasant dog and will have a 6 year old German Shorhair at home to teach her all the tricks. 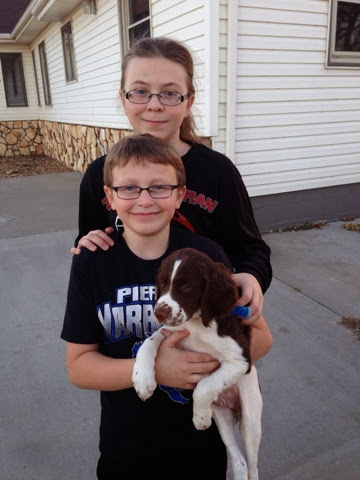 Just a little bit up the road, the Puppy Odyssey ended, at the home of Scott, Jennifer, Hannah, and Hayden Magnusson. Scott owned my dog Ace's father, Jig's Ramlin Willie. 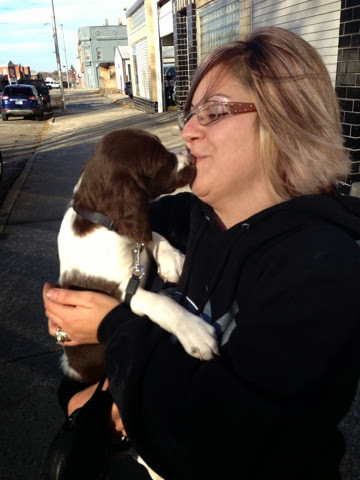 We met several years ago at a National NSTRA Trial and he mentioned he'd like a pup by Ace. Here was my chance to reciprocate. When he mentioned a few days of bird hunting, I casually told the BandC there was no way on this Earth I wasn't going to deliver a pup to Scott! It turns out, he loves to cook, loves to hunt, has great dogs, a wonderful wife and family and is a passable shot.